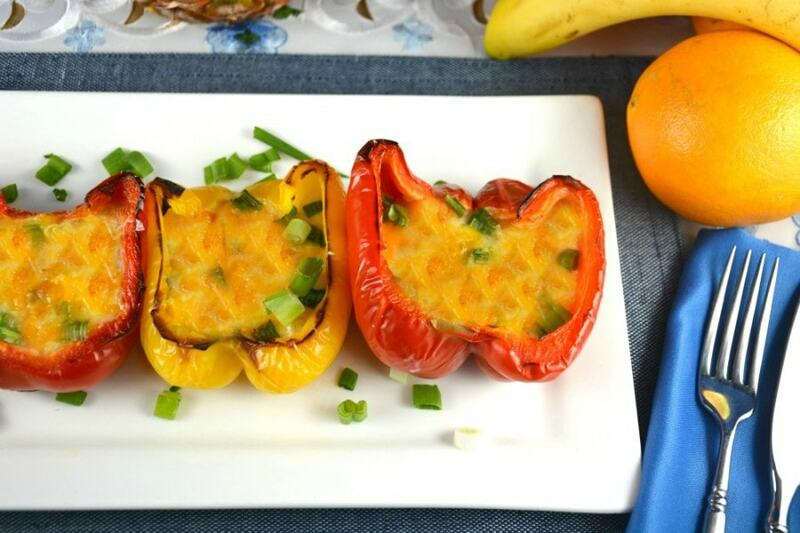 Roasted Sweet Pepper Cups and Eggs are a delicious way to serve breakfast, especially for kids! Eggs, done exactly the way you like them and so easy to eat! 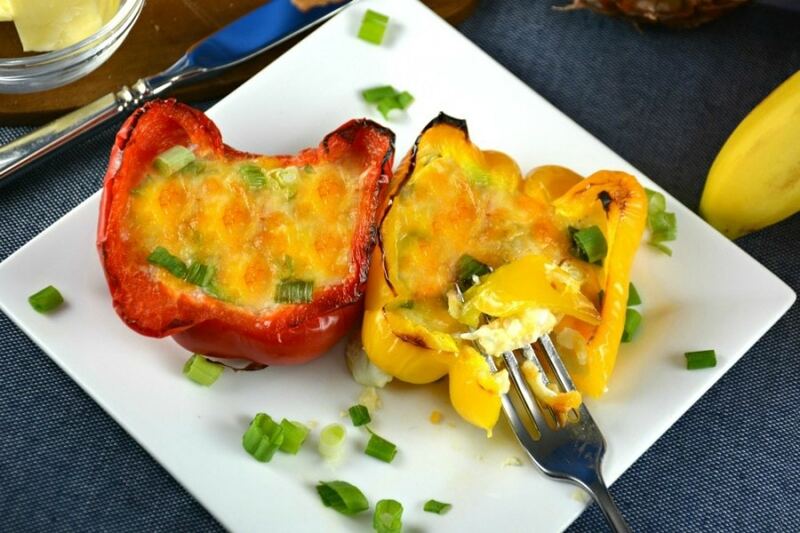 You can make your favorite kind of eggs in these Roasted Sweet Pepper Cups and Eggs. Especially when our son Patrick was small we made omelets inside each pepper and he loved helping make them all. I was in charge of preparation and he was in charge of construction! He knew what ingredients we had and he used to take orders for each pepper. He wrote down what everyone wanted in theirs and made each one perfectly! Patrick watch them bake and when they were ready I would plate them and he would deliver each with a huge smile on his face! He was always so proud of himself and he took his job seriously! I smile just remembering it. We also serve The Best Baked Eggs in a Tomato too if you are interested. 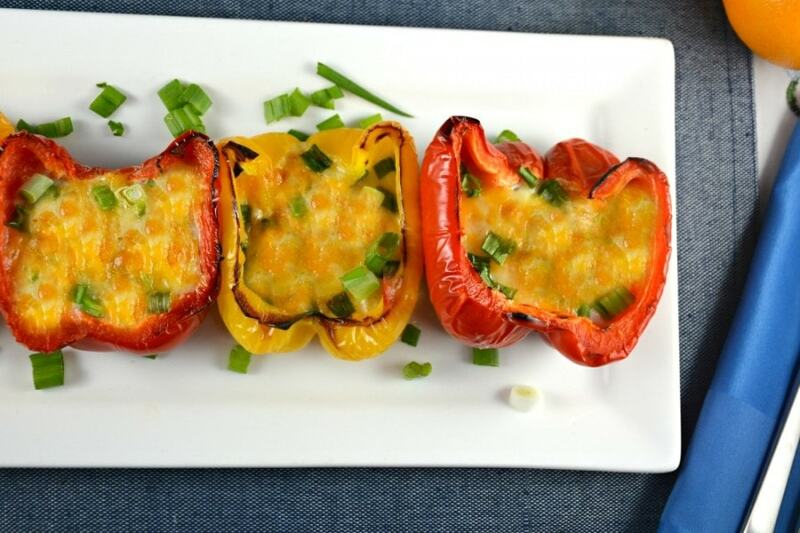 They are also delicious, easy and a little healthier start to your day as well. Definitely worth a look! Needless to say I have a few things I love to do with peppers! This includes filling them with meat and stuffing in my Stuffing Peppers or meat, rice and cheese in my Awesome Stuffed Peppers. 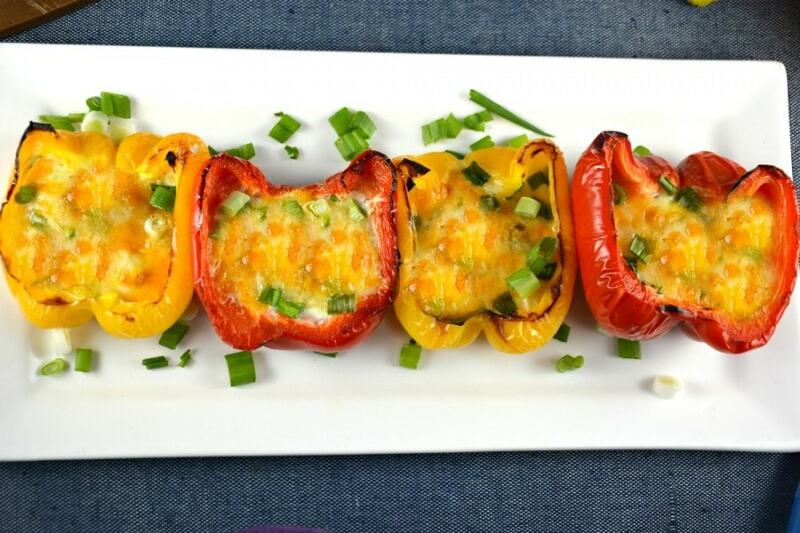 I also stuff these peppers with lentils and short rib if you are interested in trying them too, they are fabulous, here is the link Lentil Short Rib Stuffed Peppers! 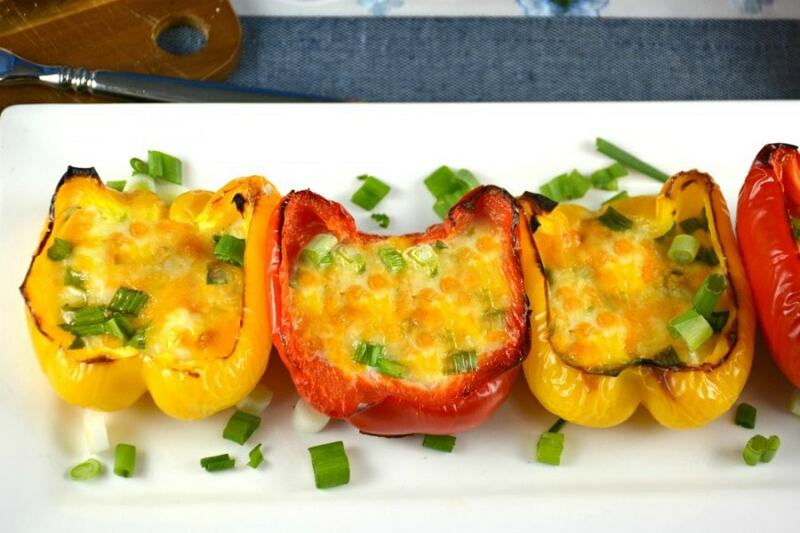 You should also have a look at our recipe for Chicken Melts in a Pepper which is a personal favorite of mine! Now that I think about it I use peppers in so many recipes and I can’t seem to help it! The last recipe I am going to mention in is an easy Simple Steak or Chicken and Peppers Stir Fry which is full of peppers and either steak or chicken! Totally tasty too! 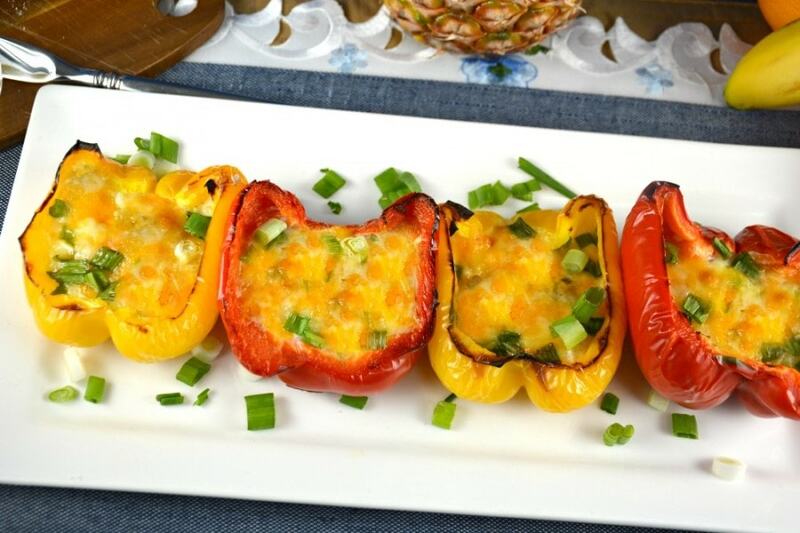 You really can use any toppings you want or need to make these Roasted Sweet Pepper Cups and Eggs. Whatever you would have in an omelet will most definitely work here or you can just crack an egg or two inside and bake them just like that! Perfect for dipping your yolks in without making a mess! I love that the runny yolks stay inside each cup! 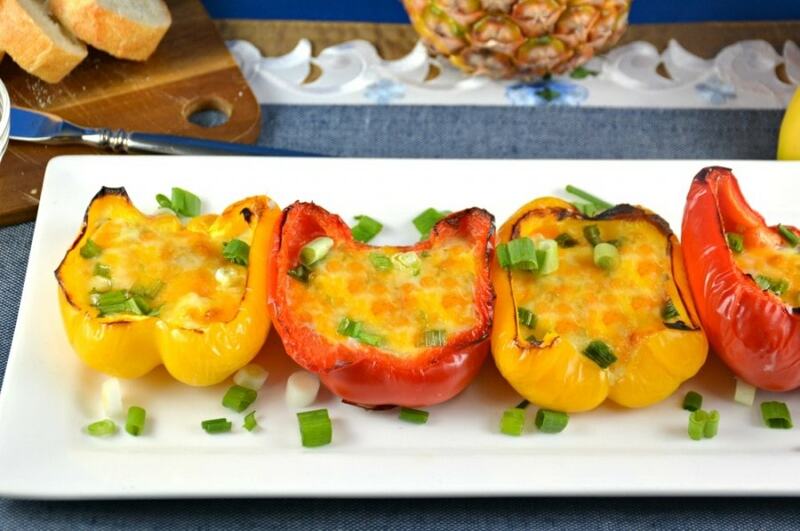 Roasted Sweet Pepper Cups and Eggs are delicious and a simple way to serve breakfast or brunch for a crowd too. You can decide how big of a pepper you buy. The smaller peppers will hold one egg and the bigger peppers two! They look so bright and colorful on a serving plate! Preheat your oven to 425 degrees. Halve and core your sweet peppers, slicing right through the stem. Place on a foil lined baking sheet, cut sides down, and bake for about 10 minutes. You want the peppers to start to soften. They have to be able to support the egg or eggs and whatever else you add to them. Remove from oven and flip the peppers over. Sprinkle with cheese, add meat if you are using it and some green onions. Crack 1 or 2 eggs into each pepper half, sprinkle with salt and pepper. Bake until egg whites are almost set, between 8-10 minutes if using 1 egg per pepper or 12-15 minutes if using 2. Sprinkle with remaining cheese and rest of green onion. Broil until cheese is melted and lightly browned, about 1-3 minutes.